Support built-in firewall, defense against ARP spoofing, Port scanning, DDoS/DoS attack. Support limitation on maximum NAT sessions. 1 x USB 2.0 port for file sharing. Support DSL, FTTX LAN and Cable Modem Internet access. The firewall protects against attacks including DoS (Denial of Service) attacks, IP-based attacks and access by unauthorised remote systems. Wireless, Ethernet and VPN are also protected by various protection systems. 1U 2-Port with VDSL EHWIC. 1 x RJ11 VDSL Cable. Cisco 1921. The Cisco 1921 builds on the best-in-class. In addition, the platforms support the industry's widest range of wired and wireless connectivity options such as Serial, T1/E1, xDSL, Gigabit Ethernet, and third-generation (3G) wireless. 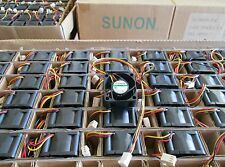 C819G-4G-V-K9 - C819 M2M 4G LTE for Verizon, 700 MHz Band 13, EVDO Rev A. C819 M2M 4G LTE for Verizon, 700 MHz Band 13, EVDO Rev A. Cisco C819G-4G-V-K9. Can't find what you're looking for?. Unsure if this is what you need?. Ideal for CCNA CCNP CCIE. (256MB DRAM & 64MB Flash IOS 15). 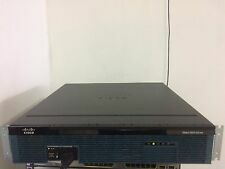 Cisco 2801. Ideal for Cisco CCNA CCNP CCIE Lab. 128MB DRAM. 32MB Flash. The RB3011 is a new multi port device, our first to be running an ARM architecture CPU for higher performance than ever before. 10/100/1000 Ethernet ports 10. Ethernet test results. USB slot type USB 3.0 type A. 128MB Flash. IOS 15.1-4. 512MB DRAM. Rack Mounting Brackets. SHELF CODE: P32 11/4 10 GH. WHAT'SNOT INCLUDED: - Requires 'kettle' power lead / Other cables / Software / Accessories / Installation advice etc. Ideal for Cisco CCNA CCNP CCIE. M9 128MB Flash & 256MB DRAM. 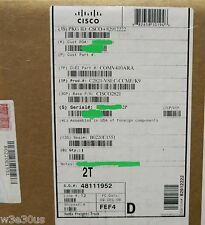 2x Cisco 2811. 128MB Flash. 256MB DRAM. Ideal for Cisco CCNA CCNP CCIE. 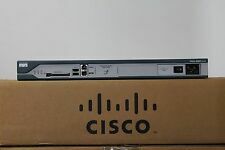 1x Cisco 2811. 256MB DRAM. 64MB Flash. No Rack Mounting Brackets. Ideal for Enterprise Networks or Cisco CCNA CCNP CCIE Lab. (Cisco 3845 MB). (256MB DRAM & 64MB Flash). 256MB DRAM. 64MB Flash. Cisco 3845-MB with Brackets. Rack Mounting Brackets. 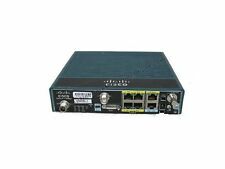 Cisco Systems Cisco1921-SEC/K9 Cisco1921/K9 with 2GE, SEC License PAK. Can't find what you're looking for?. Unsure if this is what you need?. Network Hardware Depot. 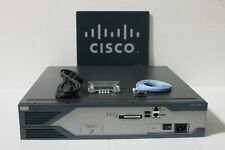 Cisco CISCO2901-SEC/K9. We will also accept Credit Cards from. Can't find what you're looking for?. Unsure if this is what you need?. Network Hardware Depot. Good condition and working. Comes with psu but no rack ears. Ideal for Enterprise Networks OR Cisco CCNA CCNP CCIE Lab. 256MB DRAM & 64MB Flash. 1x Pair of Rack Mount Brackets. Ideal for Cisco CCNA CCNP CCIE. 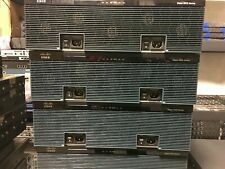 3x Cisco 2811 with Brackets. 256MB DRAM & 64MB Flash. 256MB DRAM. 64MB Flash. Rack Mounting Brackets. Cisco IOS Software, C2900 Software (C2900-UNIVERSALK9-M), Version 15.1(4)M4, REL. A summary of U.S. laws governing Cisco cryptographic products may be found at data datak9 Permanent datak9. (Cisco 881G). 1x Cisco 881G. Cisco PCI Card. Ideal for your Enterprise Network or Cisco CCNA CCIE Lab. 1x UK Power Lead. Exemptions with the right to deduct. M10 with Brackets & VPN Module. 1x Cisco 2811 (512MB DRAM/128MB Flash). (128MB Flash 512MB DRAM). Ideal for Cisco CCNA CCNP CCIE. 1x Rack Mounting Brackets. 1x UK Power Lead. Ideal for CCNA CCNP CCIE Lab or Enterprise Network. Missing 2x WIC Blanking Plates. Ohne Netzteil. - ohne weiteres Zubehör. Für Verbraucher nach § 13 BGB. Huawei AR1220V with 2x Gigabit & 8x FE Ports with No Brackets. Cisco 887M-W. 1x UK Power Lead. 1x Power Adapter (Power Cube). Alle Teile sind gebraucht aber 100 % funktionsfähig! All parts are used but 100% operational! The hardware has been overhauled and tested by our test lab. 1 x Netzkabel. 1 x Power Netzteil. 1 x USB Port. Network Hardware Depot. Can't find what you're looking for?. Unsure if this is what you need?. Also available serial cables, back to back. Photos to be added soon. Ideal for CCNA CCNP CCIE Lab or Your Enterprise Network. No Rack Mount Brackets. Ideal for Your Enterprise Network Or Cisco CCNA CCNP CCIE Lab. (256MB DRAM & 64MB Flash). 1x Cisco 1841. 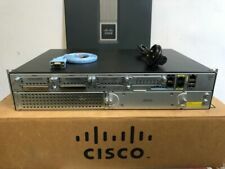 2x Cisco WIC-2T. 1x UK Power Lead. For Sale . Ideal for your Enterprise or Cisco CCNA CCNP CCIE Lab. Cisco 886-K9. Huawei AR1220V with 2x Gigabit & 8x FE Ports & ADSL A/M & Brackets. M1.bin" Last reload type: Normal Reload Last reload reason: Reload Command This product contains cryptographic features and is subject to United States and local country laws governing import, export, transfer and use. Die Funktion ist einwandfrei. Die Ware wurde gereinigt und getestet. Zustand gebraucht / guter Zustand. T.bin" Last reload type: Normal Reload Last reload reason: Reload Command This product contains cryptographic features and is subject to United States and local country laws governing import, export, transfer and use. Model Number. Network Hardware Depot. Triple Pack (3x) New Draytek Vigor 2860 2862 Router Rack Mount Bracket Kit 19"
The bracket size is one rack slot (1U). Fantastic deal. Much less expensive than the original and good quality! Good quality replica item. Perfect fit. CCNA CCNP CCIE. Ideal for Cisco CCNA CCNP CCIE Lab. With 128MB Flash & 256MB DRAM. 128MB Flash. 256MB DRAM.